Smart cities may seem like far-off abstract concepts but in reality they already exist today. Imagine a city where the streetlights know when people are walking past and light up or dim down accordingly. Where the bus stops do not just offer transport updates, but free WiFi, charging stations and city information. Where sensors in green spaces monitor rainfall and humidity, allowing city workers to save resources by watering only where required. Sounds pretty clever right? But this is no city of the future we are referencing. It is Barcelona, today in 2017. When we talk about ‘Smart Cities’ we still tend to view them as abstract concepts. However, to make this assumption is to overlook the initiatives that are already being rolled out abroad and at home. For example, in the UK, Glasgow street lights have been fitted with CCTV which send alerts when noise rises above a set level to enable monitoring for criminal behavior. Across the country smart motorways monitor vehicle flow and use automated traffic management methods to reduce congestion. Elements of what we often think of as the ‘fictional smart city, are springing to life all around us. So far so exciting, but you may have noted a lack of these advances in your local high street. This is because, before smart city initiatives become ubiquitous, there are a number of challenges that need to be tackled. Smart cities are founded on the concept of the Internet of Things. This means millions of connected devices and sensors that record and harvest data. This data will then be categorised and analysed, enabling infrastructure to make autonomous decisions about it own operations. This marks a step change when it comes to city planning and there are a huge range of technology focused skilled that will be required to make it happen. However, turning a city from a collection of silent structures to an interactive ecosystem is no small task, and will require an army of developers to implement. Automating everything from parking to power generation is a huge undertaking. This is worrying given the digital skills gap facing the UK. Demand for IT professionals is predicted to increase by 15 per cent in the next eight years whilst the number of students training to work in the industry has fallen by 50 per cent. Impending Brexit negotiations could also impact our ability to hire tech talent from the EU, compounding the problem. A likely side effect of this demand for digital skills will be a change in recruitment policy for technical roles. We are already observing a shift as businesses hire people with a high level of technical knowledge, but fewer formal qualifications than traditionally expected for ‘professional’ roles. This approach to hiring is reflective of a culture shift whereby younger generations are learning through gaming, coding and programming in their free time, rather than in a textbook at school. When looking to enter the workforce, this generation look to open source platforms where they can observe and learn from leading developers from across the globe. This method of developing workplace skills should not be overlooked as it is already producing a wider talent pool for UK businesses and public sector organisations. 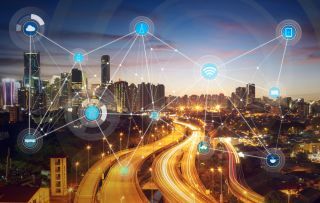 Another challenge in developing smart cities is security, due to an exponential rise in the number of connected devices that exist on the network. This increases the number of potential entry points for cybercriminals looking to exploit consumer and corporate data. This British public are very aware of this risk with 69 percent of registering concern about the massive amounts of personal data that fuel the running of a smart city. The consequences of data breaches are well documented with high profile tech businesses recently hit by an attack which saw personal data, chats and passwords leaked for an ongoing period. With the proliferation of interconnected city-wide networks, there is a real risk that we will see more of these incidents impacting towns rather than businesses. Although the security of smart cities poses one of the most serious challenges to the concept, I believe it is one the development community can rise to. The key to doing so will be collaboration. The sheer volume of access points to the city network can seem daunting and even the most experienced developer or security professional could fail to spot every vulnerability. However, if the code for smart cities is created using open source platforms, it would allow the worldwide development community to peer-review and patch flaws - vastly reducing the number of vulnerabilities that would go unnoticed. Smart city initiatives have moved far beyond the realm of novelty and are already transforming infrastructure across the country. For citizens, smart cities have the potential to remove the friction and bugbears from city living, not only reducing admin and making life easier but also keeping us safer and ensuring that public services are delivered more effectively. Looking to the future, smart cities can also lead to change on a much greater scale. Energy usage will become much more efficient, saving money and resources. Congestion and pollution can also be reduced, making our cities not just cheaper to run, but also healthier. Best of all, the advent of smart cities means that we can all play a role in the development of our future. It is up to the tech community at large to challenge governments and contractors to develop against established standards and with open source tools, publishing open source results. This will advance collaboration with the wider population, meaning everyone gets a say in how a city is, quite literally, run. A rose-tinted vision? Perhaps. But with the technological pace of change and continued uptake of open source by companies and state institutions across the globe, I am hedging my bets that the future of the ‘smart city’ looks to be a bright one.